Poll Results The Americans are ahead again. 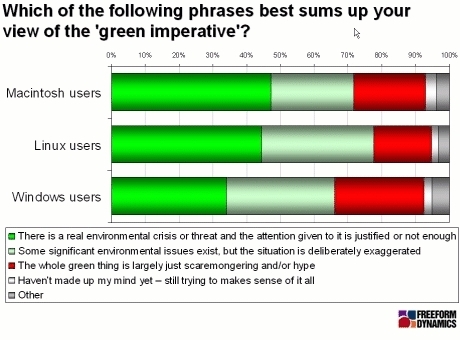 This time it's in their negative attitudes towards the "green imperative". We asked for your feedback in December and followed up with a quick poll in January. Our thanks to the 3,000 or so folk who responded. 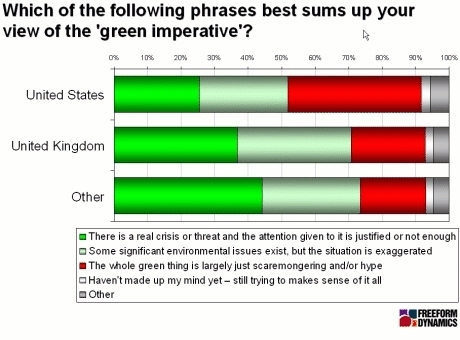 But what a stark contrast between North American respondents and the rest of the English-speaking world. Freeform Dynamics has analysed the responses to January's poll and discovered that the mood, by and large, is that "something must be done". What is comforting from the environmentalist's perspective is that, while IT people vary in their degree of concern, more than 65 per cent of them believe environmental issues do exist, even if they don't agree about their seriousness. When it came to questions about what action could be taken, a quarter of respondents were totally defeatist. They took the view that nothing meaningful could be done. Perhaps this is understandable when you consider the broad picture. Some countries have been watching others build huge economies with fantastic living standards and, not surprisingly, they would like some of this for themselves. China, for example, has something like nine motor vehicles per thousand head of population while North America has 1148. Let's look at the chart. This time it's the average of the red and orange bars that tell the story. But, once again, the figures for the United States are particularly telling. 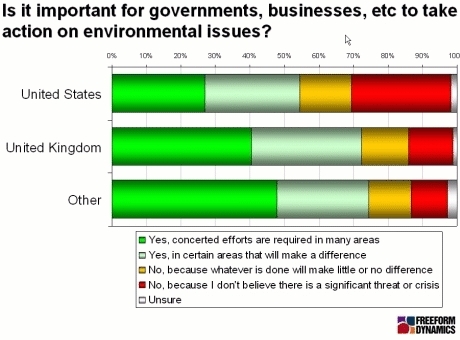 Forty-four per cent of respondents from that country believed governmental or business action would be pointless. No one knows whether action would be effective or not in reversing the impact of climate change. But everyone with a granule of common sense would recognise the unsustainability of polluting our environment and consuming non-renewable resources. Both would be gifts to future generations. However, some would say that science will overcome the problems of diminishing resources and cleaning up the consequences of pollution. Yet others just want to enjoy the ride until humanity finishes itself off. The issues can be aired, especially with respect to IT, in the Register's online debate on 27 February. A couple of weeks later, each registrant will receive a copy of the full Reg Green Computing Research report. Already, readers have contributed an enormous amount of insight through the surveys. If the contributions to the debate are anything like these, participants are in for a lively and very interesting few hours.